Glasstech Boat Service has been providing superior specialty marine services throughout the East Coast for over 14 years. We have expanded our business into a 16,000 square foot facility and now offer a full array of marine services to our customers. Here at Glasstech Boat Service, we provide owners of their watercraft, large or small, high-quality custom repair and detailing services. If the body of your vessel has suffered any type of damage, or you are looking to enhance the appearance of your vessel, or simply maintaining to keep your vessel looking new, then you’ve come to the right place. We also offer full engine services for all major brands of marine engines, as well as diesel repair and maintenance. 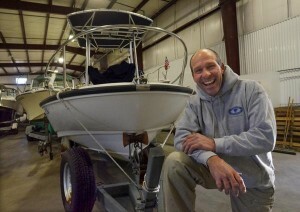 Glasstech Boat Service is owned and operated by Jeff Wilk. Jeff has been a boat enthusiast for over 30 years. Jeff’s frustration as a boat owner of trying to find dependable, quality marine service, persuaded him to take matters into his own hands, thus resulting in starting his own boat service facility. Glasstech Boat Service was designed with boat owners needs first and foremost in his vision. Glasstech’s facility allows us the ability to undergo many projects, large or small, over the winter months. This is a wonderful benefit for our customers that is very hard to come by on Cape Ann. Jeff mastered his artistic abilities with fiberglass and gelcoat repairs by working with the best developers and crafters in the business. Jeff is now very well respected up and down the East Coast for his superior artistic ability. Jeff’s unique talent for color matching is widely recognized throughout the industry.